Since I didn't have any sliced almonds around (probably because I don't like almonds anyway), I opted to make the Swedish Apple Cake that Dorie adapted from Ann Brettingen. The longest part of this recipe was peeling and slicing the apple! I need to measure my cast iron skillet because I think it's probably a 10-inch one, not a 9-inch, so my cake came out a tad thin. Regardless, it still tasted great. The only change I made to the recipe was to add 1/8 of a teaspoon of cinnamon because you can't have apples without cinnamon! I would have added more, but with only 3/4 cup of flour in the cake, I didn't want the cinnamon to be overpowering. In the end, I think it was just perfect. Thanks Nancy, for hosting this week. It's a great go-to recipe for last minute entertaining! 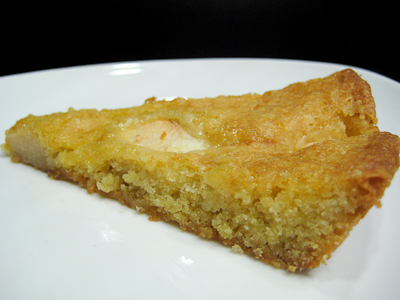 If you would like the recipe for the Swedish Visiting Cake, you can find it here. 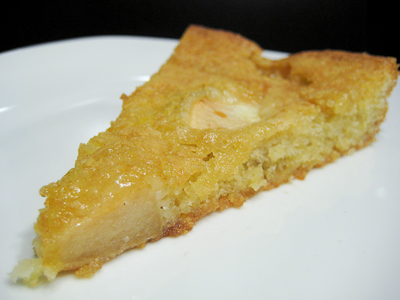 Otherwise, I've posted the recipe for the Swedish Apple Cake below. 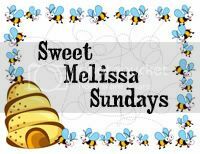 Make sure you check out the TWD Blogroll, to see how everyone else enjoyed this simple treat! - My cake was done after 35 minutes, probably because I baked it in a larger skillet. - Add 1/8 teaspoon of cinnamon to the dry ingredients to complement the apples. 1. Center a rack in the oven and preheat the oven to 350°F. (345°F if your oven will do that.) Generously butter a 9-inch deep-dish pie plate or a similar sized cast-iron skillet. 2. Whisk together the flour, baking powder and salt, if you’re using it, and keep at hand. 3. Working in a mixing bowl with the whisk, beat the egg(s) and sugar together until thick and pale. Stir in the vanilla, if you’re using it, and then the melted butter. The mixture will be smooth and shiny. Stir in the dry ingredients and scrape the batter into the prepared pan. Top with the apples, making a spiral pattern. Leave some space between each slice, so the batter can puff up between the wedges – it looks much nicer with the puffs. 4. Slide the pan into the oven and bake for about 40 minutes, or until a knife inserted into the cake comes out clean. Transfer the cake to a cooling rack. 5. If you want to glaze the cake, warm a few spoonfuls of jelly and a splash of water in a microwave oven (or a saucepan) until the jelly liquefies. Brush the jelly over the hot cake. 6. Let the cake cool for at least 15 minutes, or wait until it reaches room temperature, before you cut it into wedges to serve. This looks awesome! I love apples, especially fugi's. What did you glaze the cake with? It looks great and Im sure the apple version is rockin! I'm excited that someone made the apple variation. I'm glad it turned out so well. Though I made the plain cake, I beat that batter to a froth to get every possible height since there was no leavening agent. Oh yum! Have to try this version for sure! Ooh, looks great. Your photos always do. Thanks for printing the recipe for the apple version because I've heard about it and want to make it now! I saw on someone's post about the apple cake they put 1 teaspoon of cinnamon! yum! Great job with your cake! Thanks for the apple version. We really loved this cake as it was , but thought that apples would be a good addition. Your cake looks so tasty. neat that you found a recipe that fits this week's TWD that is adapted by dorie. nice twist. it look great! i'm not an almond girl either, so the apple is a great alternative! Apples + cinnamon = match made in heaven, and your cake looks divine! 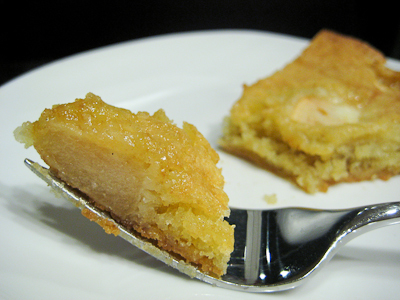 I'm thrilled that you tried the apple version; I was so enthralled with the almond one that I baked it twice. I'll be going the apple route soon, though, and appreciate your trailblazing for me! As a side note, I always love to see a gal who knows her "compliment" from her "complement" - my compliments! Thanks for baking along with me this week. Oh yum! I am planning on making this version over the weekend. Can't wait to try it. Yours looks great! MMMM!!!!! Apples and cinnamon. Great combination. Have to try this version. Yum...it looks super moist and delicious! My husband will love this. He will want to put a scoop of vanilla ice cream on it. That's a great looking cake! Good job and I will have to give it a try! ooh...I'll have to try the apple version. It sounds and looks wonderful. Ohh wow this looks delicious!! Yummy! Yumm! I remember seeing this version!! Delish!